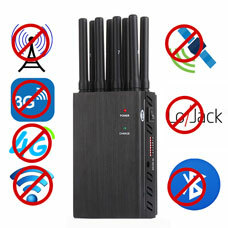 Multiband signal jammer blocks the trouble caused by mobile GPS wifi lojack. Signal blocker refers to a device that disconnects a signal and is divided into different types according to the type of the cut signal. And we're most familiar with mobile jammers, GPS blockers, drone blockers, wifi blockers, etc. And we use is most likely to block, the school will be used to prevent the behavior of the students to play mobile phone signal jammers, in class, students are addicted to mobile phones games or electronic novel, it is not allowed in class, the school in order to make the class more orderly, students can be at ease, and not affected by the outside world, so they will be in the front of the classroom to install such a device. Signal jammer is not only used by the school such institutions, as smartphones popular, uncivilized phenomenon of mobile phone use, banned the use of mobile phones more and more places, although some areas ban cell phone use, but it provides them with free wifi network, what is forbidden on the mobile phone or advocated the use of mobile phones? For national security unit, has very strict requirements for the protection of the information, so in these places need to prevent almost all types of signal, and is not only a mobile phone signal, wifi, GPS signal, unmanned aerial vehicle (uav) signals are not allowed to appear, such as the use of these products are likely to be related signal information leakage, so need to install the following similar multiband signal blocking device to ensure information security. High-tech mobile electronic products rely on a certain signal spectrum, such as GPS tracker rely on GPS satellite signal, mobile phones is dependent on the signal, and unmanned aerial vehicle (uav) is dependent on the GPS signal and remote control and so on the many kinds of signals, the more high-end products a signal types are more abundant. So the problems that may arise from these devices can be easily solved, as long as the blocked the signal spectrum, or is that they cannot distinguish good signal spectrum can prevent them from working, such as signal blocking introduced here. To learn more signal jammers type. This portable mulitband signal blocker can blocker all the mobile phone signal lojack gps tracking device signal,for home,it can block wifi/bluetooth wireless signal,jamming radius up 30 meters.